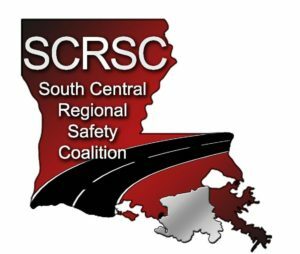 The South Central Regional Safety Coalition, formerly known as the South Central Safe Community Partnership (SCSCP), is a traffic safety coalition comprised of multidisciplinary partners/agencies throughout the parishes of Assumption, Lafourche, St. Charles, St. James, St. John the Baptist, St. Mary and Terrebonne. Tasked with the implementation of the regional version of the LA Strategic Highway Safety Plan, coined the South Central Regional Transportation Safety Plan (http://www.scpdc.org/wp-content/uploads/SCRTSP-Updated-Feb-2013_withAug2013Status.pdf) , the dedicated team of partners are charged with implementing highway safety projects and programs across the South Central Region in an effort to reduce fatalities and serious injuries in the region by 50% by 2030. We welcome you to join our life saving team of law enforcement partners, educators, engineers, emergency personal, and many other traffic safety advocates throughout our region and state . . . Because it takes EVERYONE to reach our goal of DESTINATION ZERO DEATHS! 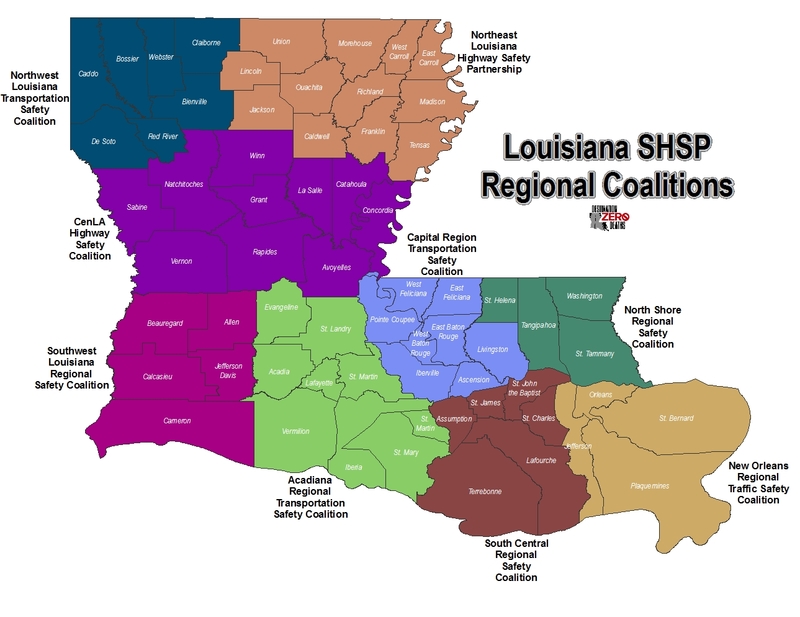 Report highway/traffic safety concerns via email to cassie@scpdc.org or through our Houma-Thibodaux MPO website. The South Central Regional Safety Coalition hold quarterly meetings 3rd Wednesday of the first month of each quarter at 10:00 AM (January, April, July, and October). The Executive Committee meets as needed prior to the regularly scheduled quarterly meetings. We also have specific emphasis area focus group meetings that are scheduled throughout the year for those that are interested in working on a specific emphasis area. If you would like to be placed on our distribution list, please email Ms. Cassie Parker at cassie@scpdc.org or call 985-851-2900. 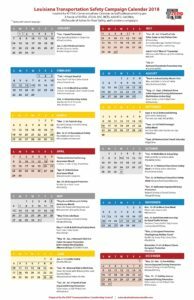 Utilize Traffic Safety Marketing to promote! 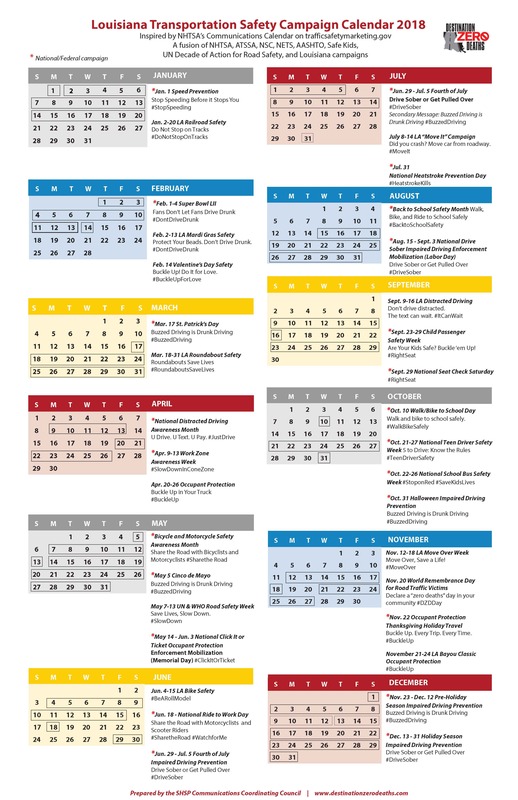 You can see that NHTSA Calendar’s calendar is incorporated in our LA Safety Calendar.